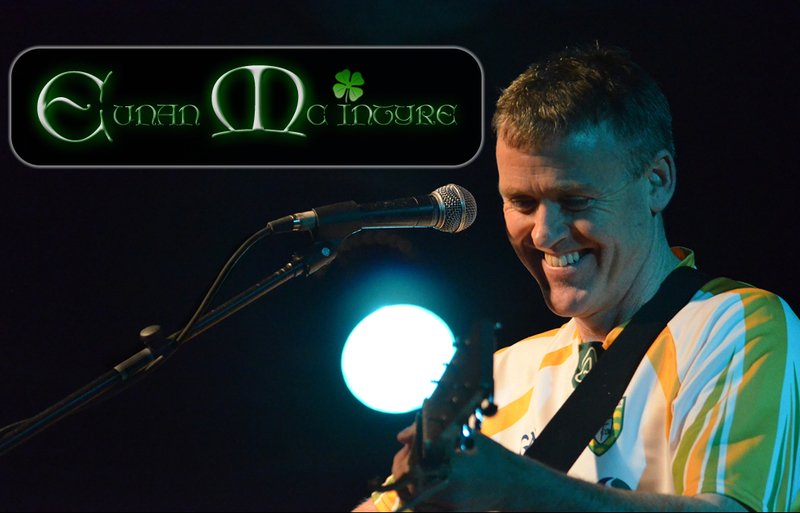 Eunan Mc Intyre is an award winning singer/songwriter from Glencolmcille in Co Donegal, Ireland. He is influenced bythe beautiful natural surroundings in which he grew up, and now lives with his wife Jackie and family. Eunan writes about the lace he was born, his experiences being part of a big family (he’s one of 16 children), and his love of traditional ballads. He’s toured in Canada, the United States and Luxembourg and has also played in Spain with Enjoy Travel. In addition he has toured extensively in Switzerland both as a solo musician and supported by the Swiss band “Tacha”. Eunan has headlined the Ancent Order of Hibernian’s St. Patrick’s Day celebration at the Indiana Roof Ballroom in Indianapolis, Indiana, and has also performed there at the Greening of the Canal in 2011, 2012, 2013, 2014, 2015 and 2016. He is best known for his songwriting skills and his warm personality. While he is on stage he can reach into the heart of the audience with his Irish humor, and his own songs. Eunan has won several song competitions in Ireland and in 2000 he received the Pete St John ASCI caward for his song “Josie” which also won the Sean Mc Carthy All-Ireland traditional Ballad song Competition. He won this competition again in 2002, and has on several occasions received first prize in the Clonmany song competition.In 2011 he was a prize winner again with his song “Some day We’ll Fly Away”. He has also won the Keadue song competition in Roscommon. Eunan has supported acts such as Tommy Sands, Sean Keane and the Legendary Wolftones. He has also supported Danny Doyle, Daniel O’Donnell, and Sean Cannon, a member of the Legendary Dubliners.Last year he supported Charlie Landsbourgh as well. To date Eunan has released five albums and a new DVD based on his own material. His first album was just called “Collection of Songs”, and then he released “All the love you Bring”, “Rathlin Sky” and “Blown on a Breeze”. He has also released a live album with the Swiss band Tacha based on a project called “The Challenge Between Cultures”. Eunan is hoping to release a new CD before his up coming tour of the States. Eunan has also performed for a Celtic music agency who specialize in wedding music, church music, receptions, and hooleys. Eunan performed with and created a wedding band called “Slainte!” Slainte! (meaning Cheers!) who played a mix of music that catered to all tastes. They specialized in weddings, and concerts with a lively Celtic feel to their music. Slainte! has since disbanded, but Eunan continues to perform for any special needs outside of his current concert schedule. Play a song here! Go to the Music Store link to buy right now!